I've had Moneydance for several months and downloaded transactions easily if I entered the Access Code provided by Capital One. 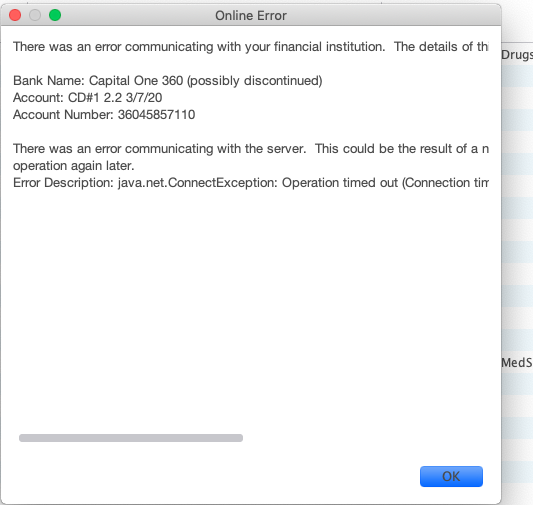 For the past few weeks, Moneydance won't connect with Capital One anymore and, if fact, lists them as Capital One 360 (possibly discontinued). How can I get my transactions to download into Moneydance? I am having the same issue and will be watching for updates here. I did call Capital One and they were not able to help from their end. Thanks for posting. If this is the case and read the thread for more information, as other have indicated it may be time to switch banks. System closed this discussion on 07 Mar, 2019 04:50 PM.